If you haven't seen the March 2008 issue of WOOD Magazine, take a look at page 32. 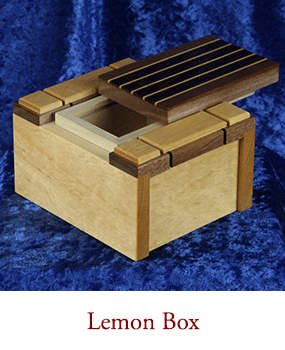 INCRA's own Puzzled Guy, Perry McDaniel is featured in a 6 page article that highlights his interest in puzzle box making. 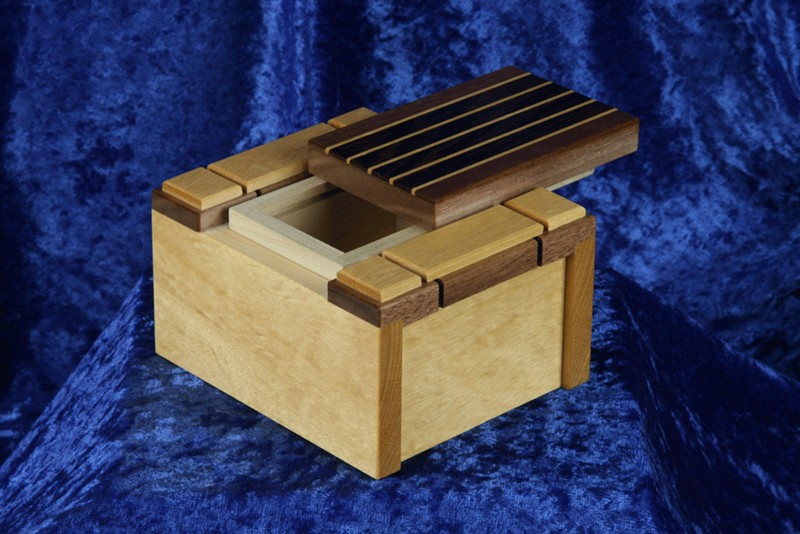 The article includes plenty of information on making two of Perry's sliding dovetail puzzle boxes using the INCRA Fence System. Here's what Perry has to say about his favorite box project. 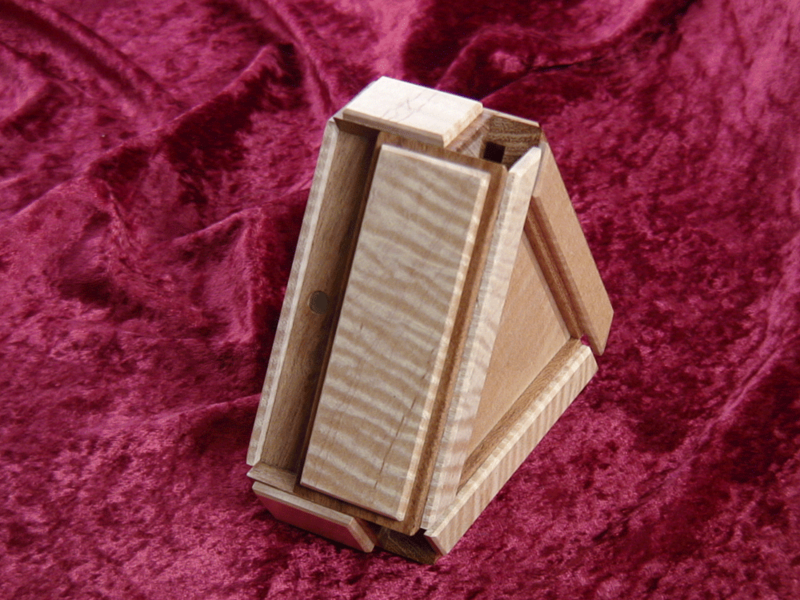 The “Sandfield Joint Puzzle” as shown in the WOOD Magazine article, set the hook for what has become a feverish fascination for producing ever more complex and devious boxes. While most of the 4500 + boxes Perry has made over the last 13 years represent about 20 Sandfield/McDaniel collaborative designs executed in 200 piece limited edition production runs, Perry has designed another 19 unique boxes produced in smaller quantities. 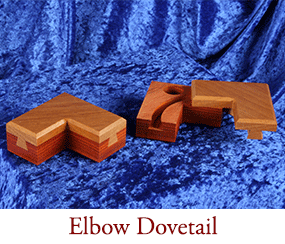 One of Perry’s favorite boxes is the “Elbow Dovetail”. 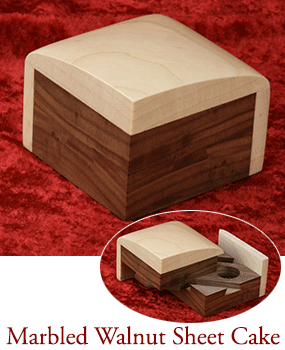 This small two-piece puzzle features an “L” shape with dovetails holding the top and bottom together. 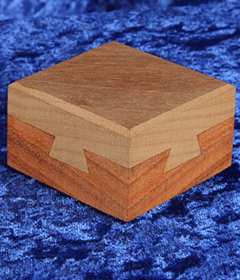 When you pick one up Perry will tell you that the dovetails are connected, but looking at the design, it would appear that the dovetail would have to turn 90 degrees. That’s impossible! That is until you solve the lock. 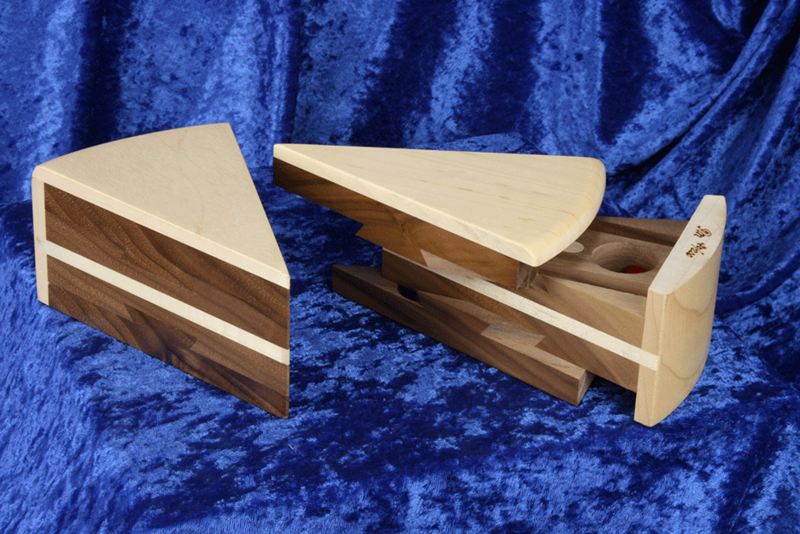 The two pieces are held together with a curved sliding dovetail. We’re told it is made with the INCRA Fence System, though we’re still not sure how he did it. 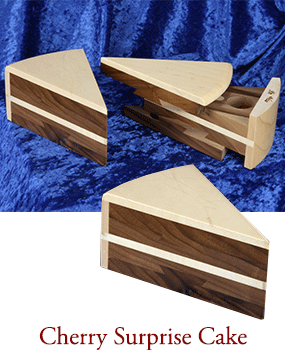 Not all of Perry’s designs feature a sliding dovetail. “Sixty” was commissioned for a friend’s 60th birthday. “All of the angles used were of course 60 degree angles and the interior held 6 bags of tea (Six Teas). While the assembly was difficult, cutting the pieces accurately was made easy with The INCRA Miter Express and my INCRA Miter1000SE. This box really didn’t need much of a lock, because just about everywhere you put your hands when casually picking up the box would prevent the box from opening. The trick is to use a special “three finger” grip in holding the box as the two pieces are pulled apart." 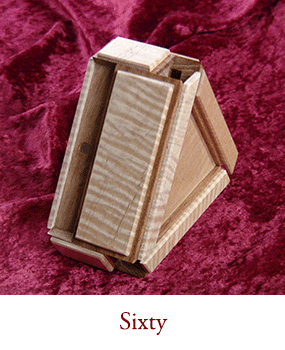 For more information about puzzle genres and puzzle making Perry recommends any of the books written by Jerry Slocum. While most of his writings are focused on the history of puzzles in general, his clear writing style and beautiful pictures will certainly inspire and he always includes a few wooden puzzle designs with dimensions. For geometric puzzle designs take a look at any of Stewart Coffin’s available works especially, The Puzzling World of Polyhedral Dissections. 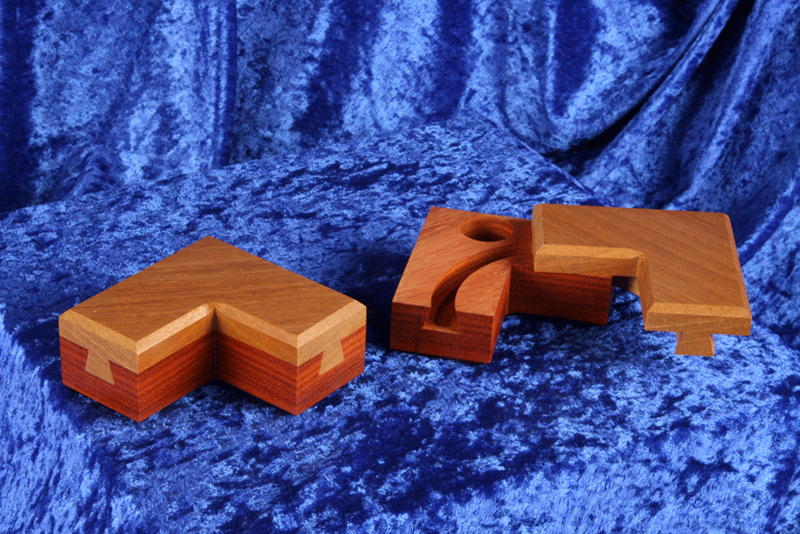 If you want to see a variety of puzzles on the Web check out www.johnrausch.com. It’s a virtual maze of puzzles; with links to many of the best puzzle designers, makers and sellers from around the globe. To view some of the incredible works coming out of Japan visit the Karakuri Group’s website at:www.karakuri.gr.jp/creation/. If you are already making puzzles for fun, or have a unique puzzle box idea you can't wait to try out, you might want to take a look at the First Annual Stewart Coffin Puzzle Craft Contest sponsored by INCRA and CubicDissection.com. Cash prizes and some nifty Incra tools are offered for the winners. You can learn more about the contest rules at http://www.cubicdissection.com/contest/contest.html. The “Marbled Walnut Sheet Cake” has a 7 step opening sequence to finally get to the marble that is hidden inside. If you are not able to view the book or you do not have Adobe Acrobat installed, you may download it here. Simply follow the instructions provided by Adobe.